Η Porsche παρουσίασε πριν λίγα λεπτά την νέα GTS έκδοση της 911, προσθέτοντας άλλη μια στην ήδη πλούσια υπάρχουσα γκάμα του μοντέλου. Η δεύτερη γενιά της έκδοσης θα είναι διαθέσιμη από τον ερχόμενο μήνα, και έρχεται να ολοκληρώσει την οικογένεια των “Gran Turismo Sport” μοντέλων, μετά την Boxster GTS, Cayman GTS και Panamera GTS. Η 911 GTS θα είναι διαθέσιμη τόσο στην ανοιχτή, όσο και στην κλειστή έκδοση, σε δικίνητη ή τετρακίνητη επιλογή. Μηχανικά, ο κινητήρας παραμένει ο επίπεδος εξακύλινδρος 3,8-λίτρων της Carrera S, που στην προκειμένη αποδίδει 430 άλογα, αύξηση της τάξης των 30 ίππων. Συνδυάζεται με το Sport Chrono πακέτο, που διαθέτει νέες βάσεις της μηχανής και το σύστημα Porsche Active Suspension Management (PASM), χαμηλώνοντας το αμάξωμα κατά 10 χλστ. Με το PDK κιβώτιο διπλού συμπλέκτη επιταχύνει για τα 0-100 χλμ/ώρα σε 4 δευτ. (4,2 δευτ. η Cabriolet), που είναι κατά 0,1 δευτ. ταχύτερη από την S, ενώ η τελική της ταχύτητα κυμαίνεται από 300 μέχρι τα 306 χλμ/ώρα, με το στάνταρ 7-τάχυτο χειροκίνητο κιβώτιο και την κίνηση στον πίσω άξονα. Αισθητικά οι GTS εκδόσεις ξεχωρίζουν καθώς όλες φοράνε το φαρδύτερο body kit της 911 Carrera 4, μαζί μετα πλατύτερα μετατρόχια. Φοράνε στάνταρ ζάντες αλουμινίου 20 ιντσών με μονό κεντρικό μπουλόνι, και βαμμένες σε ειδικό μαύρο ματ χρώμα. Επίσης, διαθέτει σκουρόχρωμα εμπρός φώτα, νέο εμπρός προφυλακτήρα, το κάλυμμα του κινητήρα διαθέτει μαύρες γρίλιες για την εισαγωγή του αέρα, ενώ και οι απολήξεις της εξάτμισης είναι σε μαύρο χρώμιο. Τέλος, στο εσωτερικό, το μεγαλύτερο μέρος της καμπίνας είναι ντυμένο με αλκαντάρα, όπως όλα τα GTS μοντέλα. 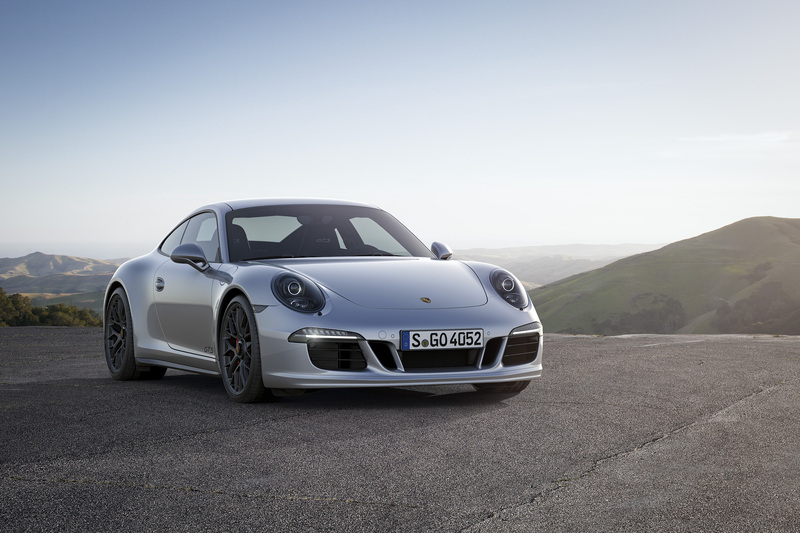 Porsche today announces the second generation of the 911 Carrera GTS, ahead of its arrival in showrooms this November. 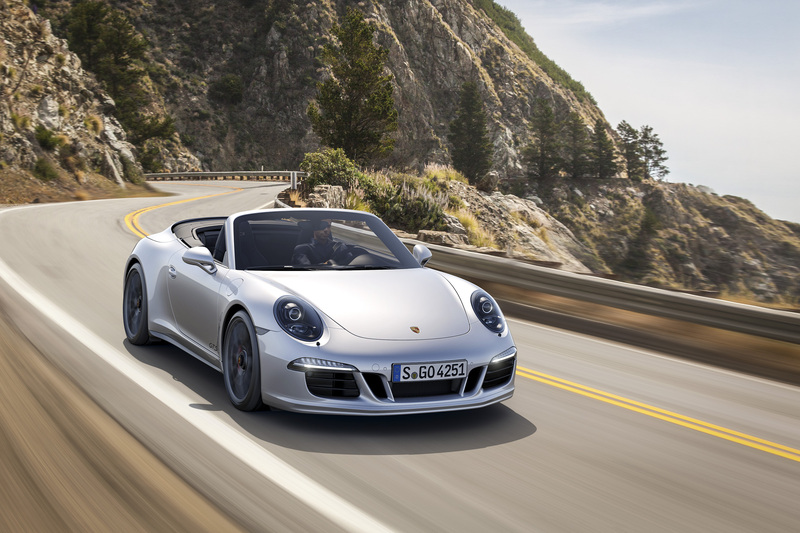 It will join the acclaimed Boxster GTS, Cayman GTS and Panamera GTS in the range of sports cars from Stuttgart. 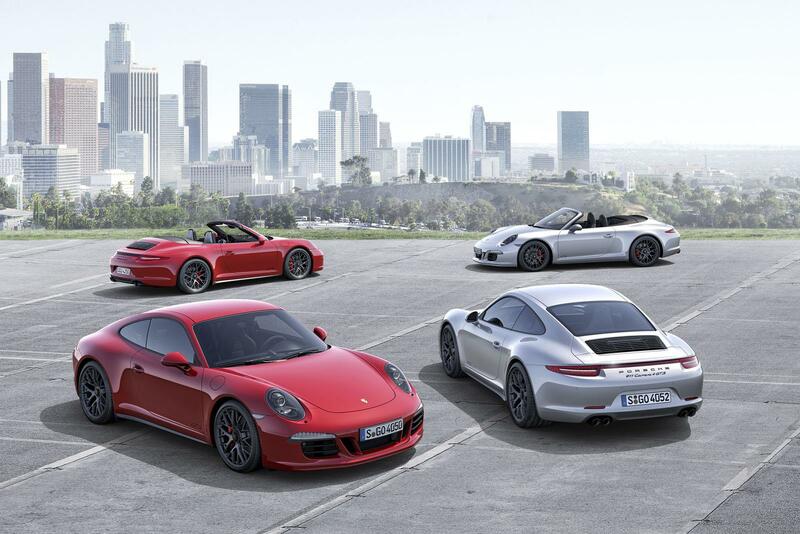 Each of the four new 911 Carrera GTS models – a Coupé and a Cabriolet, available with either rear-wheel or all-wheel drive – build on the established core values of the iconic rear-engined 911 by adding further technical features to generate even higher levels of dynamic performance and driving enjoyment. Under the rear engine lid lies an evocative flat-six power unit, tuned to develop 430 hp, an increase of 30 hp over the Carrera S. This is combined with the Sport Chrono package offering dynamic engine mounts, and Porsche Active Suspension Management (PASM) damper system which lowers the car’s ride height by ten millimetres. Improved efficiency has also led to quicker acceleration and higher top speeds, and Combined fuel consumption figures remain unchanged from the favourable level of the S models. For example, when combined with the Porsche Doppelkupplungsgetriebe (PDK) double-clutch gearbox, the 911 Carrera GTS can return 32.5 mpg and also sprint from zero to 62 mph in 4.0 seconds (Cabriolet: 4.2 seconds). With the standard seven-speed manual transmission and rear-wheel drive, a top speed of 198 mph is possible. 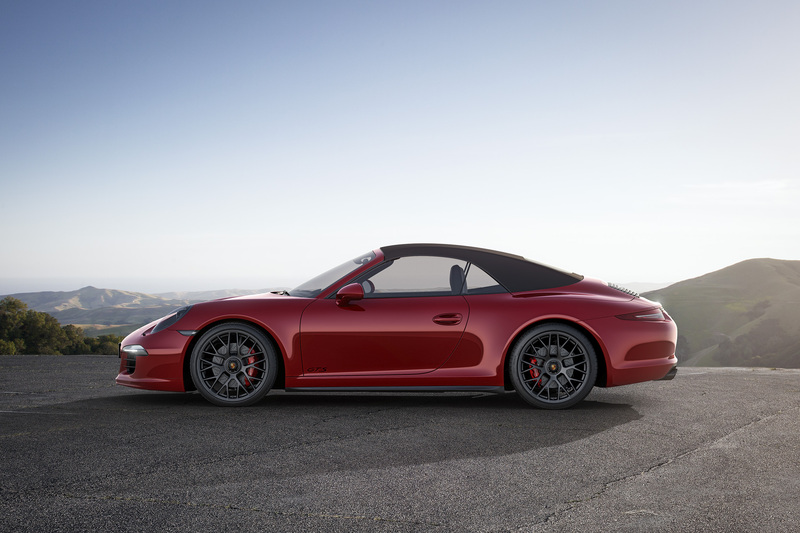 The exteriors of the new 911 Carrera GTS – like other GTS models – differ significantly from the other Carrera models. 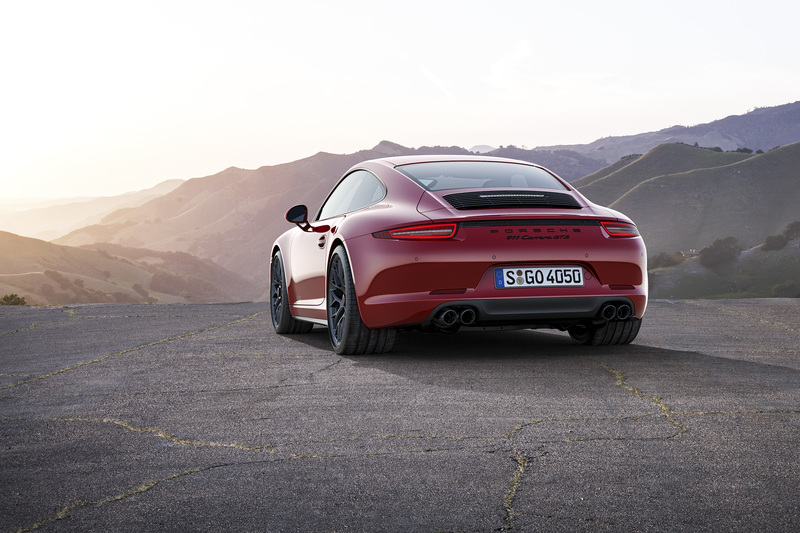 All versions feature the 911 Carrera 4 body with wide-flared rear wheel arches and a wider track. Also standard are 20-inch diameter alloy wheels with centre-lock mechanism, painted in an exclusive matt black finish. Accentuating the nose styling are special trim elements and smoked bi-Xenon headlights with the addition of the Porsche Dynamic Lighting System (PDLS). The air intake grille on the rear engine lid features bespoke GTS black trim strips and black chrome-plated exhaust tailpipes add to the strong visual identity. Further aural distinction is delivered via the standard sports exhaust system, which delivers an unmistakable GTS sound. The driver and front passenger sit in an exclusive Alcantara interior with leather-trimmed sport seats. The centre seat panels are finished in Alcantara, as on the other Porsche GTS models. 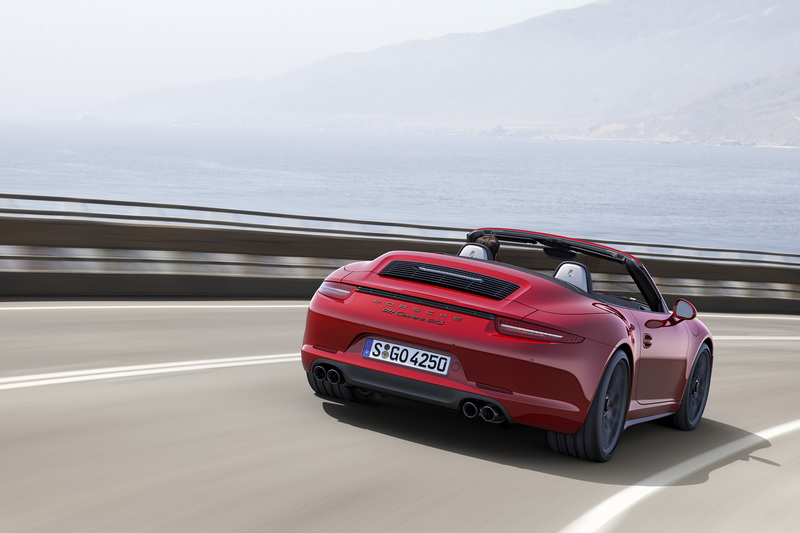 With the addition of these new top models, the 911 Carrera range now consists of 12 sports cars at three power levels, as Coupés and Cabriolets, and in rear-wheel and all-wheel drive configuration. The new 911 Carrera GTS models are available to order from Porsche Centres in the UK and Ireland from today, with first cars arriving in showrooms during November. Standard equipment includes black tinted bi-Xenon headlights with Porsche Dynamic Lighting System, sports exhaust, Sport Chrono Pack with dynamic engine mounts, leather/Alcantara interior trim, sports seats, 20-inch centre-lock alloy wheels, Porsche Active Suspension Management (PASM), Porsche Torque Vectoring (PTV) with rear limited slip differential, 7-inch colour touch-screen Porsche Communication Management with satellite navigation, digital radio, a universal audio interface offering MP3 connectivity, automatic climate control, Porsche Stability Management (PSM), Porsche Vehicle Tracking anti-theft system, three year warranty and three year roadside assistance package. 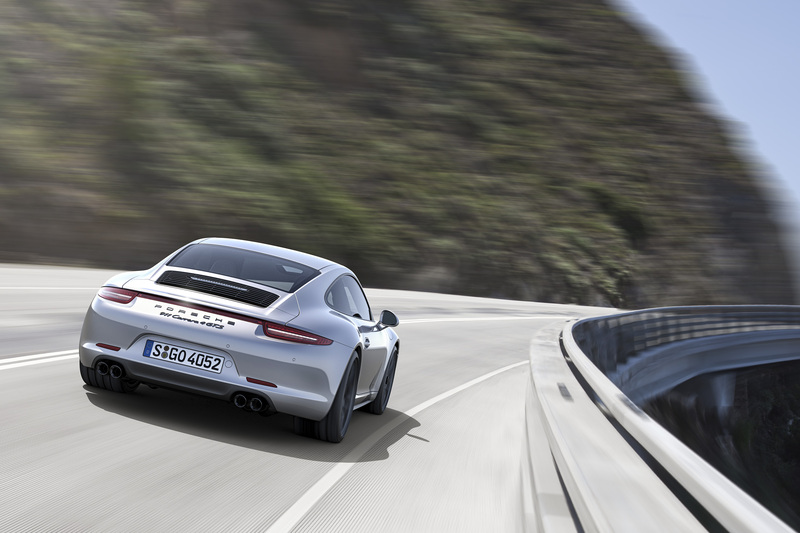 The 911 Carrera 4 GTS models add Porsche Traction Management (PTM) all-wheel drive. Customers will also be able to explore the potential of their new car by participating in a complimentary course at the Porsche Experience Centre, Silverstone. Since the legendary 904 Carrera GTS of the 1960s, the letters ‘GTS’ have stood for ‘Gran Turismo Sport’ and a promise of outstanding levels of Porsche performance. 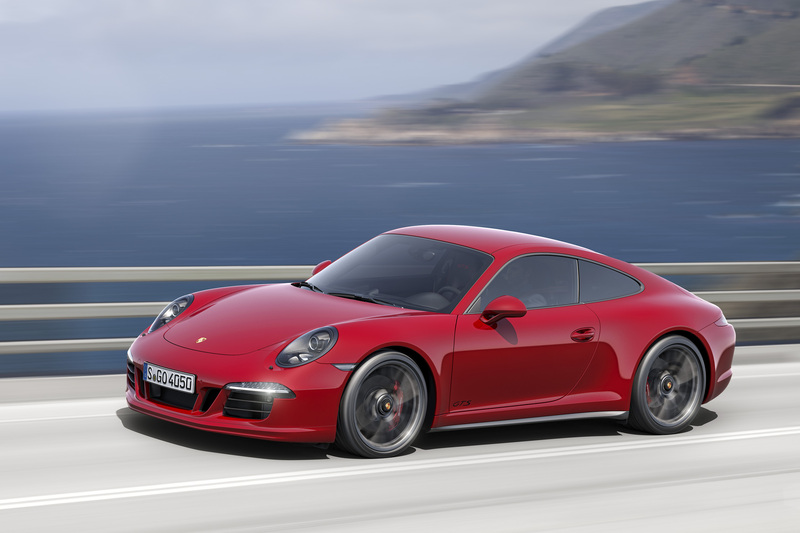 With the new model, Porsche is extending the GTS principle once more to the 911 Carrera. Like the Cayenne GTS, Panamera GTS and Boxster and Cayman GTS models already, this is a car that stands for superior driving dynamics in its segment. The combination of letters originates from the 904 Carrera GTS, a race car dating back to 1963 that could also be registered for use on public roads. In the 1980s and 1990s, the 924 GTS and 928 GTS cultivated this principle. It was reborn in 2007 in the form of the Cayenne GTS, and was subsequently applied to the ‘Type 997’ 911 Carrera and the Panamera.